Tofino has a long whale watching season, running from March through to November. It starts with a mind boggling 20,000 Grey Whales swimming past our shores in spring on their annual migration from birthing waters by the Baja Peninsula north to the Bering Strait by Alaska. Some of these massive mammals stay in our waters for the summer, giving ample opportunities for viewing. 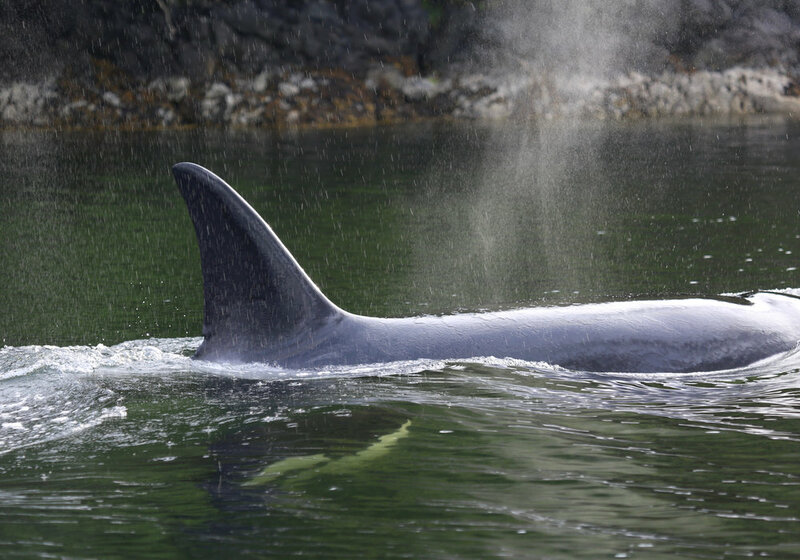 We also see Killer Whales and Humpback Whales feeding and playing in the waters of Clayoquot Sound. Tofino Whale Watching Tours connect you with the west coast elements, wildlife and nature. You will be fully equipped for an adventure in red floaters suits to keep you warm and safe on board our Open Boston Whaler vessels. If an open Boston Whaler is not your boat, ask us about our covered + heated vessel options. Enjoy the views of rugged coastline, whales, marine wildlife and so much more. We venture to common feeding areas near Long Beach, Vargas Island and Flores Island to view cetaceans in their natural habitat. 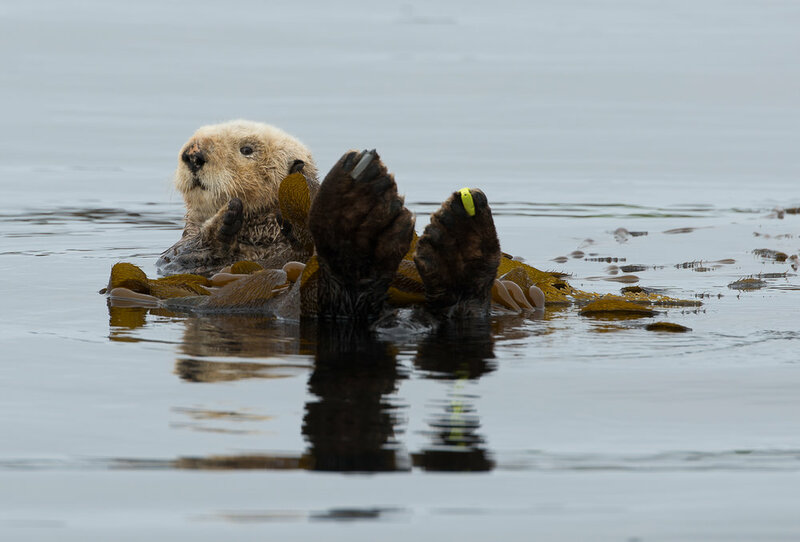 You will also see sea lions, sea otters, bald eagles, seals and more. Ask us what whales we are seeing when you book your tour! *Read our Guarantee for Sightings. Check in time for all tours is 30 minutes before departure. Grey Whales highlight our Whale Watching Tours. 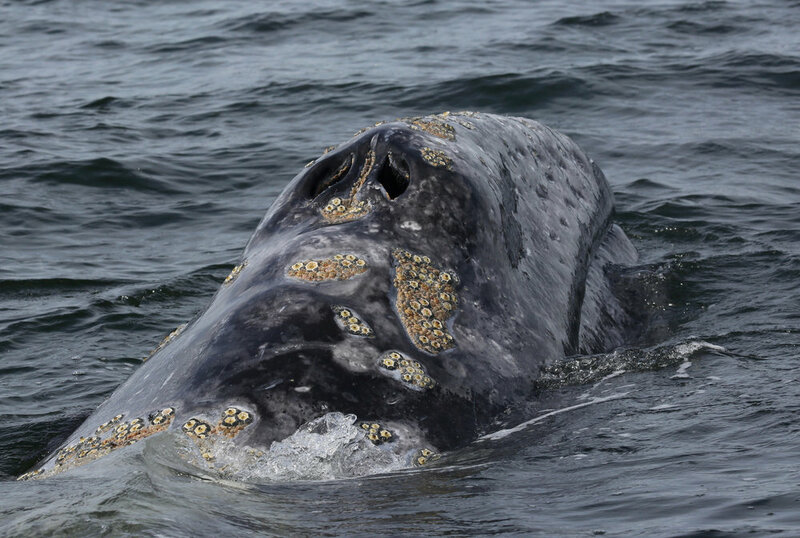 We are able to view Grey Whales from early March to November! We see Humpback Whales and Killer Whales on our whale watching tours too but not every day. Humpback Whales are in Clayoquot Sound May - September, depending on where their food sources go. Killer Whales are a wild card and will randomly show up. We see mostly see Transient Killer Whales in Clayoquot Sound. Fully guided whale watching and wildlife viewing tour (2.5 - 3 hours). Experienced, qualified and passionate skippers to answer all your questions. Departure times are 10:30 am, 2:00 pm and 5:00 pm. We use open 12 passenger Boston Whaler vessels with twin high horsepower engines. You are provided with protective Mustang floatation suits, gloves and toques. This tour travels through both protected and open coast marine waters in Clayoquot Sound. We follow the Whale Wise Viewing Guidelines to protect marine mammals and be respectful of their space. Dress warmly! We suggest a warm sweater, long pants, closed toed shoes and a toque. Bring your sunglasses, camera, video, binoculars and your sense of adventure. We will provide you with a Mustang Survival Suit for warmth and floatation but these suits are not waterproof if it rains. Make sure you read our booking policies before processing your reservation. Check in time for the Whale Watching Tour is 30 minutes prior to departure time at our office at 411 Campbell Street. An eco wildlife conservation fee of $3 will be added to each fare in support of maintaining the ecosystem in Clayoquot Sound. Add 5% GST tax to all tours. We reserve the right to add a fuel surcharge (currently $4.00). Multi-tour discounts, 10% off second and additional tours. Group rates available for 10 or more. Online bookings must be made 24 hours in advance, to book a tour in the next 24 hours please call our office to book (250) 725-2132. When booking online you will receive a confirmation email within 48 hours of your booking. This tour has a 48 hour cancellation policy. Parking is available on our property but if the lot is full here is some parking information. Our open air 12 passenger Boston Whaler vessels are excellent for viewing and photographing wildlife. With twin high horsepower engines you are ensured a safe and exhilarating ride through the waters off Tofino. The driver is located in the centre of the boat to ensure they can communicate with guests. This tour is available March to November. As long as the whales and weather cooperate we will take out tours! *Online bookings must be made at least 24hrs in advance. To make a booking for a time within the next 24hrs please call for availability. We saw sea otters, seals, sea lions and two impressive grey whales and felt like seeing all big mamals you could meet in the area ;=) We spend a long time with them and got to see the whales very closely without disturbing them. Sign up with your email address to receive news, promotions and wildlife reports.